"We created FreshGrade for Schools with teachers and students in mind," said Terri-Lynn Brown, Vice President, Product at FreshGrade. "The ability to directly connect assessment and feedback to evidence of learning is increasingly important to educators." FreshGrade, the portfolio and assessment platform that deepens the conversation about learning, today announced the upcoming release of FreshGrade for Schools. The new offering supports principals' pursuit of improved learning outcomes, engaged students and parents, and reduced teacher workload. FreshGrade for Schools provides all the features of FreshGrade for Districts, without the need for Student Information System (SIS) integration. Instead, educators can upload students to the platform with a simple spreadsheet. FreshGrade makes it easier for teachers to communicate learning with parents and students. Using a single tool, teachers create a richer understanding of student achievement and progression. "We created FreshGrade for Schools with teachers and students in mind," said Terri-Lynn Brown, Vice President, Product at FreshGrade. "The ability to directly connect assessment and feedback to evidence of learning is increasingly important to educators. FreshGrade helps them do exactly that without adding hours of work to their week." Teachers using FreshGrade for Schools can empower students to capture their learning through video, picture, and audio files, then self-reflect on their progress in student portfolios. Principals can access unique data insights on how teachers, parents and students are using FreshGrade through monthly reports. Google Translate is integrated to easily engage parents who speak English as their second language. "FreshGrade has allowed us to facilitate parent-teacher communication in a way that further strengthens parent involvement and improves student achievement," said Wanny Hersey, superintendent of Bullis Charter School in California. Teachers can also save hours of administrative work. Pre-populated state, regional, and national objectives make it easy to show progress towards standards. The Gradebook helps teachers assess on-the-go using one of the platform's flexible assessment scales. 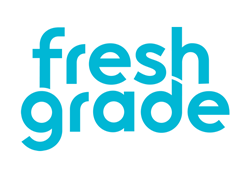 FreshGrade for Schools will be available by mid-July, in time to implement for the 2018-19 school year. Visit http://www.freshgrade.com/schools for more information. Founded in 2011, FreshGrade was created by a dedicated team who saw a better way to help educators, parents, and students have deeper conversations about learning. Today, FreshGrade is used in over 70 countries worldwide. The portfolio and assessment platform helps educators, parents, and students have deeper conversations about learning. Plan activities, capture evidence, give feedback, and track progression through standards and custom objectives. Create a richer understanding of student achievement and progression. Encourage students to reflect on and own their learning. Engage parents at every turn.